His Holiness Patriarch Mor Ignatius Aphrem II received the British Consul General in Erbil His Excellency Mr. Angus McKee accompanied with the Embassy’s First Secretary Political Officer Ms. Palika Bhasin. 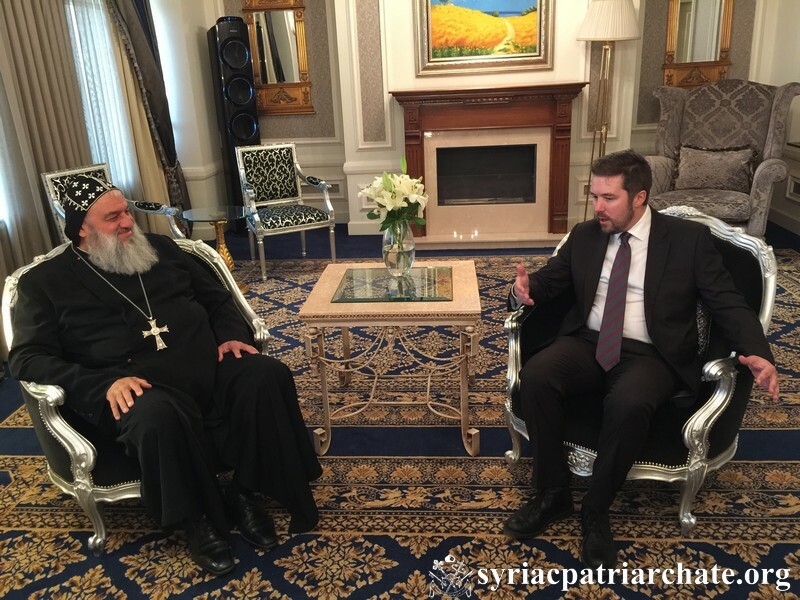 His Holiness gave an overview of the history of the Syriac Orthodox Church and discussed with His Excellency the current situation of Christians in the Middle East and especially in Northern Iraq. In turn, His Excellency assured His Holiness of the intention of the UK to fight terrorism along with other countries. He also expressed his interest in the history of the relations between the Syriac Orthodox Church of Antioch and the Church of England, which is about two centuries old. Their Eminences Mor Gregorius Saliba Shemoun, Patriarchal Counselor, Mor Justinus Boulos Safar, Patriarchal Vicar in Zahleh and Beqaa, Mor Timotheos Moussa Al-Shamani, Archbishop of the Archdiocese of Mor Matta Monastery, Mor Philoxenus Mattias Nayis, Patriarchal Vicar in Germany, Mor Nicodemus Daoud Sharaf, Archbishop of Mosul, Kurdistan and Environs, Mor Timotheos Matta Al-Khoury, Patriarchal Vicar in the Patriarchal Archdiocese of Damascus, and Very Rev. Raban Joseph Bali, Patriarchal Secretary and Media Office Director were also present during the meeting. This entry was posted in Featured News, News and tagged His Excellency, His Holiness, Northern Iraq, Patriarchal Vicar, Syriac Orthodox Church by Orthodoxy Cognate PAGE. Bookmark the permalink.